Huge collages of printed pages are a central visual element of Kentridge’s work and they acquire additional resonance here. They pervade his Lulu, like they did his production of The Nose before it. (Catherine Meyburgh is credited with projections and Sabine Theunissen with the set; it’s unclear to me to what extent the work is theirs and to what extent it is Kentridge’s. The images are very much in his style.) The set is covered with collages of newsprint–not all newspapers but also dictionaries, phone books, and other small-type oddities. Rough paintings and drawings, of the posing Lulu or of faces known and unknown, are superimposed on this print, piling up into dense mazes. These are expressionist in general and resemble the work of Emil Nolde in particular. Sometimes newspaper-like intertitles underline particular lines of the text. Sometimes people are wearing newsprint masks. I did notice, however, that none of the print was in Fraktur, the Gothic typeface still used by many German papers during this time. It’s a potent symbol: Lulu is constantly being classified, described, represented. When we first see her, she is striking an awkward pose for the Painter, one which she will re-assume at several key, not necessarily logical points in the opera. (Note: yes, this means she is not brought on for the Animal Tamer. Instead we see her projected image.) Her portrait is constantly passed around but here it is on a relatively small piece of paper, one which we, the audience, especially those of us up in the balcony, never see. It could be one we saw on the looming walls. Or maybe it’s not. Lulu seems to resist any single image. As the opera reminds us, writing something down might make it fixed but it doesn’t make it true. If you disagree I have some Jungfrau Railways stock certificates I’d like to sell you. The set is structured by massive panels of images. They move to create smaller spaces, which have the furniture to represent the various settings in minimal but recognizable fashion. But these spaces are almost incidental and neutral, overshadowed by the larger images that surround them. And it’s all moving: the people, the panels, the images projected onto them. But even as Lulu seems to be controlled by others, she is doubled by an ever-present dancer in a Louise Brooks bob who observes and reacts to the action. The double and her male counterpart are the first people onstage at every act. Their power over the action and their purpose in the production’s word are never made clear, nor do they seem to add much. It’s a lot to watch while also trying to take int this incredibly complex score. Unlike the professional critics, I spent the first two acts not in the orchestra but up in the balcony. (For Act II, a friend found me an empty seat in Row N orchestra.) And I found it dizzying, difficult to track the singers at many points. I was also watching the big pictures, and the silent figures, and the titles projected onto the set. (These, by the way, miss some important lines, beginning when the Animal Tamer draws out the “leeeeebenslüstige Frauen” to no translation in the very opening of the opera, to, at the very end, the Gräfin Geschwitz’s futile line about how she’s going to fight for women’s rights.) When I sat in the orchestra for the third act, and the singers weren’t so tiny, it was much easier to make everything out. Few productions find any visual expression for this structure. Kentridge is not unique in that. But by creating a new superstructure, he effectively buries the existing one. I don’t think that Lulu’s formal construction is the only interesting thing about it. (Many scholars who have written about the opera, however, have privileged this over everything else.) But this structure is vital to the opera’s tone. The number opera-like layout, the reprises, the precise choreography of the characters in the score: these all create a drama which is somewhat alienated and full of dark humor. That’s a quality which Kentridge only occasionally captures and often ignores in favor of vaguely related motion. In a larger sense, I’m not convinced that Kentridge has a theatrical language which links the action and characters to his larger ideas. The Personenregie is perfectly decent, though the experienced Marlis Petersen is vastly ahead of everyone else. (And I found Act III Scene 1, the big party scene, not very clear.) 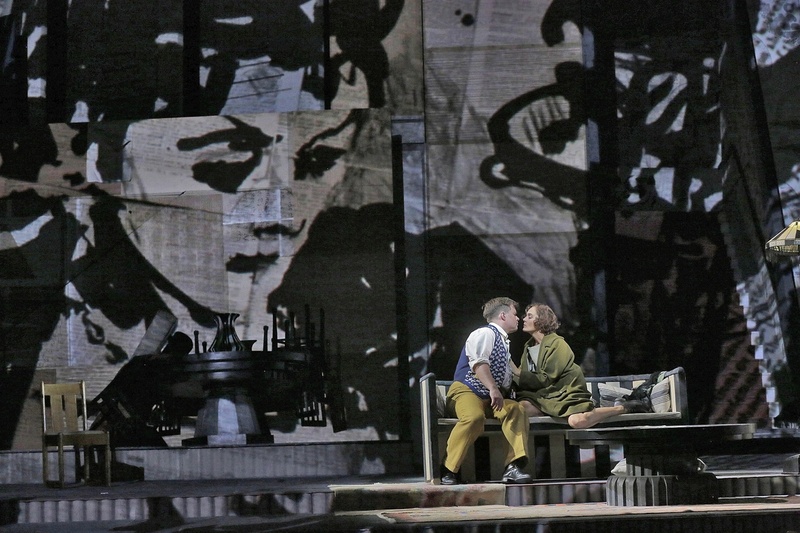 Kentridge follows the broad outlines of the score’s stage directions, though he departs in many details. But it doesn’t all connect, and this is what makes the busyness too much. Everything is running on a different track and doing different things in different ways. There’s a lot of interesting and even powerful stuff going on, but it it’s almost haphazard. The production gradually slows down, becoming less and less visually cluttered scene by scene, finally drawing to an almost austere close in London. This intimacy is welcome for the finale. I thought it was the most effective part of the whole evening and I wish it had been more present throughout the performance. Marlis Petersen’s Lulu is a well-known portrayal and she has a rare mastery over this unbelievably complex part. She sings the music almost casually, seemingly without effort (though the highest notes are at times thin). The center of voice is full and rich, and she can sound just as good at the end of the evening as she did when she started. Her Lulu is a more mature and self-assured character than we often see, more of a determinedly free spirit than a hapless temptress. I doubt this is what Berg or Wedekind imagined, but it’s compelling and modern. 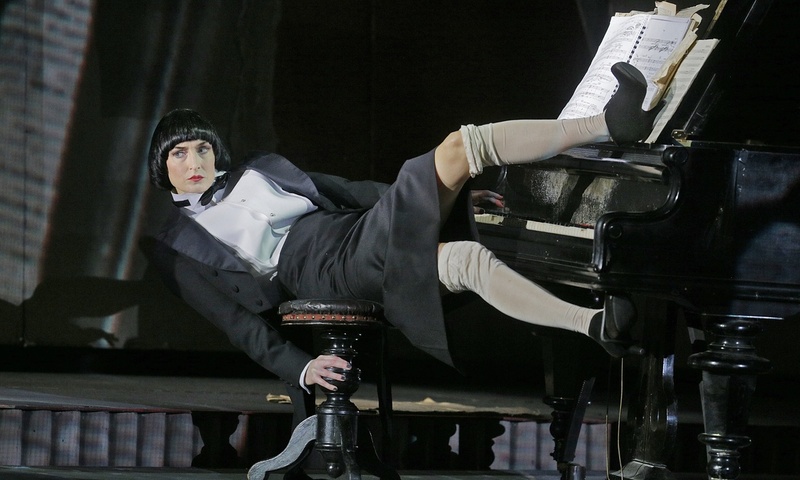 This production doesn’t go out of its way to make her look glamorous (though one suspects that this here is the opera Alwa wrote “in which her legs are the two main characters”) and she succeeds instead by force of personality. The rest of the cast was a mixed bag. 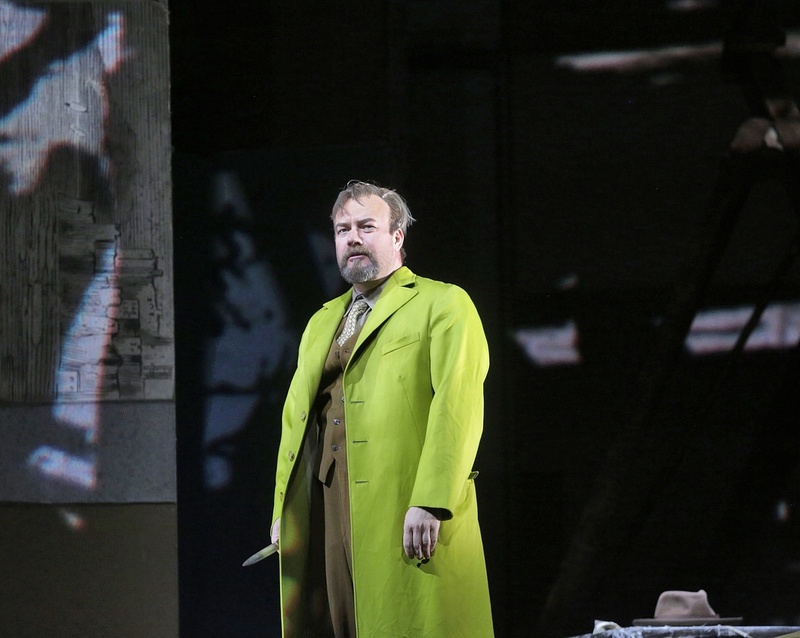 Particularly compared with Petersen’s canny Lulu, Johan Reuter’s Schön is young and tormented, and he doesn’t have much in the way of vocal gravitas. He doesn’t seem her match at all. Nor did her other spouses: Paul Groves was strained by the Painter’s tessitura, though he made an exceptionally creepy African Prince at the very end, and Daniel Brenna was inconsistent as Alwa. Alwa is, arguably, a somewhat thankless role, and Brenna did a good job of the lyrical ode at the end of Act II, but often he sounded underpowered and undercharacterized. I was surprised to see that Susan Graham had already reached the Countess Geschwitz phase of her career (it’s usually a role useful for a last hurrah), and she found considerable vocal reserves and pathos in her closing lament. In contrast Franz Grundheber has seemingly been a Schigolch for decades, though here he was rather less sleazy than usual. As the Acrobat (possibly the least attractive character in all of opera? ), Martin Winkler was more of a Mime-like hanger-on than a macho man, and spectacularly oily. Alan Oke was effective but rough as the Marquis (as well as the smaller earlier roles). 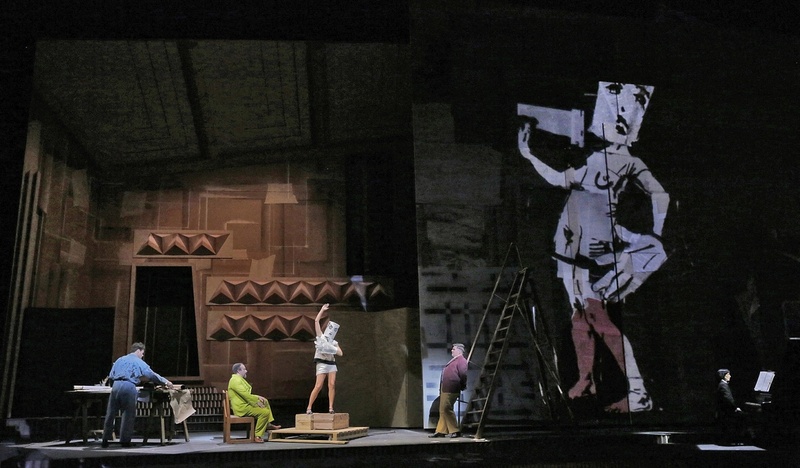 Kentridge’s production, while unfocused, is still visually dazzling and thought-provoking. I think this will come across better on the HD broadcast, where the camera will have the power to reduce the chaos to a significant degree. But if you have the chance it’s still worth seeing live for Koenigs and Petersen’s exceptional work. One other bit of news: Petersen says she’s retiring Lulu after this production (I recommend reading this interview if you haven’t seen it already). Who do you want to hear in this role next? The fantastic Barbara Hannigan already sings it. So does Mojca Erdmann, but I have generally not found her to be so fantastic. I wish Diana Damrau had taken a, er, stab at it back when she was still doing high coloratura stuff, but I don’t think she ever did. Who’s next? Brenda Rae? Erin Morley? The HD broadcast of Lulu will be on November 21. Drag your friends there. Don’t follow the Met’s lead by protesting that “twelve-tone music is scary but this one is worth the effort.” Don’t tell them it’s supposed to be difficult, tell them that it’s the 1935 version of a David Cronenberg special and involves Jack the Ripper. That’s all you need. "Who do you want to hear in this role next?" Please do yourself a favor and seek out the Covent Garden DVD with Agneta Eichenholz. She's sensational, similar to Christine Schafer in that her Lulu is completely elusive and can command attention simply by being there, as opposed to grinding and aggressively pursuing the men around her. That production is Loy's finest, the cast is flawless, and Pappano (of all people) gives the best conducted lulu I've yet heard. I have yet to see Petersen (plan on attending to HD) but I'm a bit nervous as she looks rather manic and hyperactive. I would love to see Hannigan after having seen her marvelous performance in Written on Skin this summer at Lincoln Center (apparently she also in a pretty sensational lulu dvd that I plan on tracking down at some point).. You'd have to pay me to attend another Mojca Erdmann performance (the worst Susanna I've ever heard bar none). "I was surprised to see that Susan Graham had already reached the Countess Geschwitz phase of her career (it’s usually a role useful for a last hurrah)"
Other than that, I'm sorry you seemed to disappointed. I just saw Kentridge's production of Ubu and the Truth Commision in London and thought it was pretty amazing, though flawed without a doubt. So I'm eager to see this Lulu for myself. Based on what you said, it actually sounds like a production would benefit from filming. Who has been your favorite Lulu? Hannigan is a force of nature and it's a perfect part for her. She's so intense in it though that I suspect she would burn out if she did too many. Brenda Rae would be awesome. How about Jane Archibald? Ambur Braid (ENO's upcoming QotN) has been teasing me about doing Lulu for a couple of years and I think the Kentridge is a COC copro. Superb review. Hated the doubles and overall was disappointed by the production. But then I watched the official Met trailer, and I found it thrilling! So, I suspect you are right, that this production will work much better on screen than in the house. And yet Petersen's Lulu is astonishing and is not to be missed "in the flesh." Micaela, do you have a personal favourite interpreter of Lulu? Peter, I don't think I've seen enough Lulus to say I have a favorite. I've seen the opera three times and it was Peterson in two of them. I like her, and my other Lulu was Gisela Stille, who was great too but it was Herheim (though the Herheim I remember the least about, TBH) so she's a little hard to compare in theatrical terms. She sounded great, though! I need to see the Hannigan DVD, and she's the person I would most like to see sing it live. I will try to find the ROH DVD too. I'm teaching this opera next semester so I need to pick a production to use in class–but our library's provided options are Schäfer, Migenes, and the Py-Petibon one from which I believe my eyes have not yet fully recovered. and p.s. to the above I think I"m using Schäfer DVD in class. it's an unprepossessing production–visually very generic–but as you watch it you realize that all of it is REALLY GOOD. Also just got back from the hd and loved it but I think it benefited from the cuts and mikes. Musically it was perfection though. I actually thought Reuter was amazing, vocally the best I've heard in this role. Petersen was wonderful to but I do think she was too aggressively seductive with alwa. Schafer just sits their and let's him come to her and stratas seems upset that he wants her sexually and she genuinely means it when she says she thinks he loves her and doesn't want anything. Petersen looked ready to pounce. I also think letting schon hold the gun the entire time makes the scene a tad too simplistic. As sometimes happens, the subtitles in HD were a little different to what you saw in the house, and Geschwitz did say she was going to work for women's rights! PS, after I came out of the cinema (my first Lulu) I thought, there can't be many sopranos who can take this role–and now you've listed a handful on DVD. What did you think of schafer ? What you may have also realized about the Schäfer/Glyndebourne is that, visually generic though it may be, it is meticulous about observing the "staging" of the action Berg provides in the score, i.e. down to the beat on which a glass of champagne is offered or a glance directed by one character at another. Not to endorse eternal obedience to the composer's intent in such matters, obviously, but it's great to have an reference point for how this opera works when Werktreue is pursued to this extent.